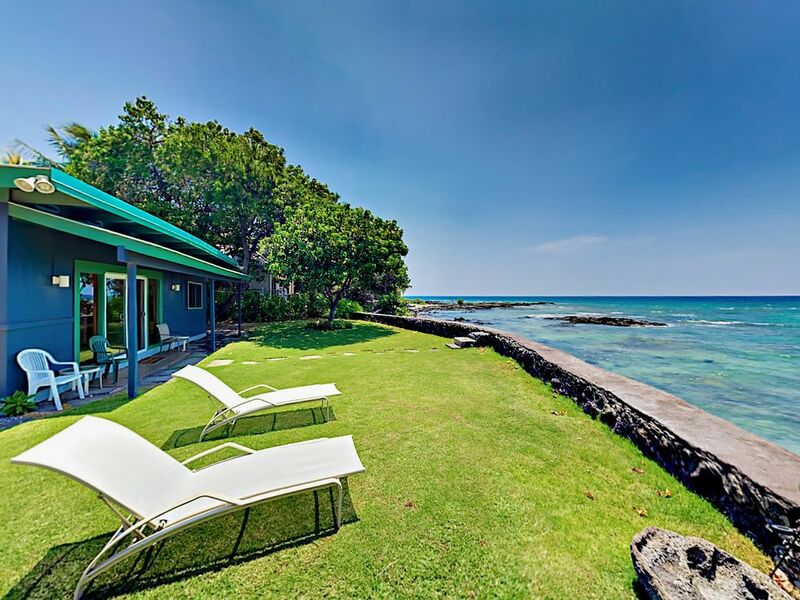 Offering an idyllic oceanfront setting in the town of Puako, this 2BR/2BA property boasts unobstructed views of the Kohala coastline. Nestled on 1/3 acre of private tropical gardens that lead to a sand and lava rock beach, this seaside locale cannot be beaten. Perfect for groups seeking extra privacy, this charming compound sleeps six total between the 1BR cottage and a separate studio. Literally right on the beach, you’ll enjoy breathtaking ocean views from nearly every room. Located in a grove of coconut palms, the beautiful yard backs right onto the lava rock shoreline, offering an excellent place to snorkel along the island's longest coral reef. There’s plenty of outdoor seating, including an inviting hammock for lazy afternoon naps. The cottage has a delightful island vibe, with aquamarine cushions and Hawaiian and Asian artwork throughout. A casual sitting area offers two chairs and two daybeds. Watch a movie on the 42” flat screen TV or hook up a vacation playlist to the Bluetooth speaker. The well-equipped cottage kitchen has a full suite of appliances for cooking tasty meals. Savor meals at the antique Hawaiian koa wood dining table with six seats or enjoy morning coffee at the two-person kitchen bar. The cozy cottage bedroom features a queen bed and ample storage space. The bath has a separate water closet; an outdoor shower is set just steps away in the garden. Please note that both showers are outdoors and are equipped with hot and cold water. The light and bright studio is outfitted with a plush king bed and a pair of cushioned chairs. An all-white second bath in the studio has a tub/shower combination. The covered outdoor shower is directly connected to the bath. Stunning ocean views on display from the tropical backyard. Spread out between two al fresco dining areas, lounge chairs, and a shady lanai. Lounge in the hammock, strung up between a pair of palm trees. Spend the day relaxing outdoors, then host an evening cookout on the grill. Extra perks include complimentary Wi-Fi, cable, and coin-operated communal laundry (coins provided). Boogie boards and beach chairs, as well as driveway parking for two, are provided. The standout feature of this lovely retreat is the dreamy beachfront setting, directly overlooking Puako Bay and just footsteps to the turquoise waters! Puako Reef, a short swim from the property, is the only true fringing coral reef on the entire island. The waters are rated AA (“most pristine”) and have been claimed to offer the best snorkeling in the state of Hawaii. Walk 3 minutes to Liquid Hawaii Charters, where you can arrange swimming with dolphins and manta rays as well as whale watching tours. Puako General Store is a 4-minute stroll, pick up essentials including groceries, chilled drinks, and beach gear/rentals such as kayaks and other watersports equipment. Great for families, Hapuna Beach State Park is just over a 5-minute drive away for swimming, picnics, and a glorious beach with warm turquoise water. Puako is authentically “old Hawaii,” a small beach town continuously occupied since 1269 A.D. with a beautiful missionary church built in the 1850s. Easily access your unit with a keyless secure door code; no need for an in-person key exchange. Your rental will be professionally cleaned and ready for you to enjoy. You can expect all the comforts of a fine hotel, including shampoo, paper products, and linens. Your home will include a HomeDroid tablet (electronic guest directory) providing specific home details. We've been making annual trips to the Reef House and Puako for the past several years. Puako is one of the most beautiful and relaxing spots in the entire state of Hawaii. And, the Reef House provides the oceanfront experience that everyone wants! Staying here gives you easy access to the entire island, as well as a quiet retreat away from the large crowds. Great sunsets and wildlife viewing, too. The property offers everything, as advertised. We can't wait to return! We celebrated a family holiday over Christmas in the Reef House and adjoining apartment--five adults, with two children. We loved every minute. The rocks and ocean at our front door were spectacular and we were so close to the best beaches--fifteen minute drives. We would definitely recommend this house for anyone loving the sea! I have stayed at this property many times over the past 14 years. It is the perfect vacation spot. In fact, my three grown children still talk about the Thanksgiving week we spent there as a family back in 2007 and say it was their favorite vacation ever. We put the three teenagers in the “big house” – plenty of room for them – and my wife and I stayed in the separate suite with the king-sized bed. It was perfect. Every day was snorkeling, hiking, boogie boarding and swimming at Hapuna Beach or Waialea Beach (aka Beach 69), and then a dinner of fresh fish grilled over kiawe wood and a spectacular sunset viewed from the back yard. Collectively over the years I’ve probably spent more than 13 weeks at the house and I’ve enjoyed every minute of it. This is the quintessential laid-back Hawaiian experience, with the ocean right outside your back door and nature all around you. Exotic birds, perfumed flowers, palm trees, green sea turtles basking on the lava rocks in back of the house, watching whales breach from the living room, walking out the back door and snorkeling with manta rays and innumerable tropical fish. And it’s all right there at the house. On one trip, a school of spinner dolphins showed up and started putting on a show (jumping and flipping) about 100 yards straight out from the house. A friend and I paddled out on kayaks and spent an hour playing with them—dolphins swimming along side the kayak, leaping and flipping over us, slapping their tails on the water. Magical. • Got up before the sun and went out on the sea kayak. Epic. Spiritual experience watching the sun rise over the volcano, all alone on the ocean. The water was so clear that it was like floating along on top of an aquarium. Saw tons of fish, cool reefs, and 2 huge manta rays. • Sunset mai tais for happy hour. Gorgeous. This evening a turtle had come right up to the sea wall – we think she was laying eggs. Fresh ono cooked on the grill. • Drove up to Waimea for the Farmer’s Market and to get some local fresh-brewed beer from the Big Island Brewing Company. • On my sunrise sea kayak adventure today, I swam with the manta rays. I had my mask and snorkel, jumped off the kayak and swam with them. • Saw whales jumping and splashing this morning while we were having breakfast. Went for a swim - tons of fish. My underwater camera caught the sound of whales singing. Perfect getaway. This is how to experience Hawaii. I have stayed at the oceanfront cottage three times and dream of going back every year. It is a quiet, private and immaculate getaway. You are surrounded by nature: turtles , whales, birds, lapping waves and gorgeous sunsets. We loved sea kayaking every morning and glorious sunsets every evening. The house is simple luxury --just as described: good beds, well equipped kitchen and and atmosphere that invites you to sit back and say "ah, this is life". The outdoor shower is a plus. Easy access to good restaurants and amenities if you can get yourself to leave. Totally satisfied. The best thing about the Reef House is the location -- right on the water so you can gaze on the ocean in the morning and watch the sunset every night. We love it so much we've returned many time over the years. The house is neat and tidy, has a beautiful dining table and comfortable bed and living room furniture. But, we find we spend nearly all our time outside - walking, snorkeling, reading or visiting Hapuna or Wailea beaches . Puako is a quiet residential street with a small grocery store up the street, but don't miss the Farmer's Market in Waimea on Saturday mornings. This is a wonderful place to relax and feel a part of the natural world. You will love it. “Operator’s Guide to Reef House” in Paradise! When you hear “TWEET TWEET, … tweet tweet,” it’s time to get up. Smell the soft morning air and gaze on the golden daylight illuminating the palms. Set out for your morning walk—Ruttle's at the end of the road, Waialea Bay, or the Mauni Lani and beyond for the adventurous. Back “home” it’s tropical fruit salad with Alta Deena vanilla yogurt and nutmeg on the sea wall to watch for whales and size up the day’s snorkeling/diving possibilities. “Dessert” is Sandwich Isle Bakery's multi-grain bread, toasted and buttered, and a glass of cold milk. Catch the morning’s rays for an hour “power tan,” then don mask and fins and join your turtle buddies in a dive or snorkel. Slip down to the reef off #42 if the wind is up. A garden shower and it’s LUNCHTIME!!! Three bean and potato salads, kim chee, and a couple of Beck’s from the freezer with fresh lime. You can’t maintain this pace without pause, so grab that classic Ray Chandler detective novel and ease into the hammock for an early nap. As the afternoon nears its end head down to Hapuna for some “bobbin” in the surf or body surfing. Don’t leave Hapuna until you’ve walked the promenade, touching the rocks at both ends of the beach. The Hawaiian legend says that if you miss the sunset at Puako you won’t return, so be sure to back in time for some sushi and Tanqueray & Tonics at the sea wall, watching the big orange ball ooze below the horizon. Then fire up the Kiawe charcoal in the grill and cook a succulent Ono filet from La’au’s. After dinner wrap up in a beach towel on the loungers and sip an ice cold sauterne while counting the shooting stars. After your lids start to droop, shuffle off to bed with your sweetheart and dream serenely of the next day to come!